Bosch CCS-CUD Control Unit is the central power and control station for all CCS 900 Ultro Conference System contributor units, such as the chairman and delegate units. The control unit will supply power for up to 50 delegate / chairman units, and provide control for up to 150. The unit features a built in speaker and automated, programmable control over contributor units without the need for an operator. 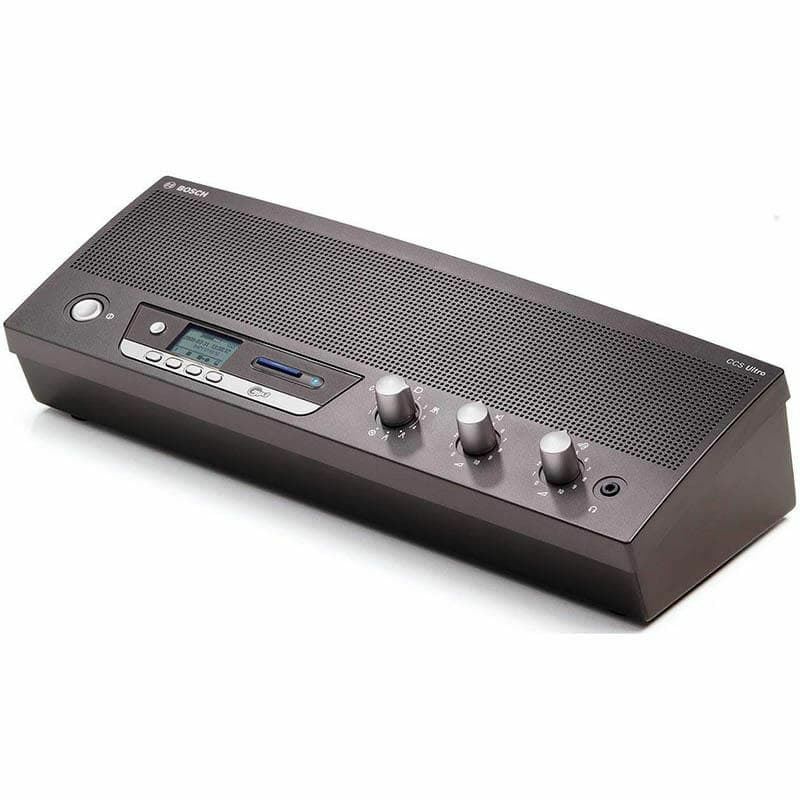 Its Digital Acoustic Feedback Suppression (DAFS) eliminates feedback howling and maintains clear, intelligible speech. Plenty of connections allow for interfacing within paging systems, amplifier systems, recording devices and more. The unit is feature rich, however its control section is straightforward and intuitive to operate in any conference setting. The digital acoustic feedback suppression facility automatically eliminates acoustic feedback (also known as 'howling' or 'Larsen effect'). This gives better speech intelligibility by allowing the speaker volume to be turned up as loud as required without any risk of feedback. The CU has two trunk outputs for the loop-through connection of contribution units. It is possible to connect 25 contribution units to each trunk output, with a maximum system cable length of 109.3 yards (100m). Up to 3 CUs can be used together in a discussion system to power and control a maximum of 150 contribution units. In this configuration a single CU acts as a master controller for the entire system. The built-in monitor loudspeaker and headphone socket allow the conference to be monitored. Loudspeaker volume control, for setting output level of loudspeakers of contribution units. This control also determines the maximum level for the headphone outputs of the contribution units and the CU. Shure SVX288/PG58Shure SVX Wireless microphone systems deliver the renowned quality of Shure wireless performance for almost any application. Shure SVX Wireless will provide years of reliable use. No other wireless system combines the same high quality, ease of setup and affordable price, in a singl..
Mikropon Studio Rode NT-2ARode NT2 A memiliki elemen kondensor multi-pola multi-pola diafragma ganda berkualitas tinggi yang besar, yang memberikan fleksibilitas maksimum dalam banyak skenario perekaman. Elektronik unggul menghasilkan kinerja noise yang sangat rendah, dan penyesuaian variabel pad, p..
Audiocore WCS-1000C Unit Mik Ketua (untuk Sistem Konferensi Wireless Audiocore WCS-1000)Audiocore WCS-1000C merupakan Unit Mik Pimpinan untuk Sistem Konferensi Wireless Audiocore WCS-1000. Menggunakan teknologi wireless digital terbaru, Audiocore WCS-1000C mampu menangkap sinyal sampai dengan 80m wi..
AKG D5 Vocal Dynamic Microphone A live performance vocal mic designed for singers in high-volume bands. The D5 dynamic vocal microphone for lead and backing vocals delivers a powerful sound even on the noisiest stage. Its supercardioid polar pattern ensures maximum gain before feedback. The D 5 st..